Deep bin liner lip cover. H x Dia. 800 x 420mm. Keeping waste secure and tidy is important in any environment, helping to keep the area hygienic and tidy. Our large bullet bins offer a great place to put waste and deters pests, thanks to the lid. 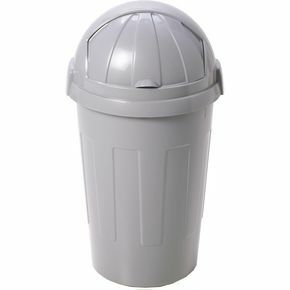 The roll top bin is easy to use and also helps to reduce the impact of smells, which may be lurking in the bins. The stay open roll flaps make it easy to deposit waste into the unit. These units have a height of 800mm and a diameter of 420mm, with a capacity of 50L. Containing 50L of waste requires a deep bin liner lip cover, which these bins have. There are three colours to choose from; silver, calico or mocha, providing options to suit a workplace's requirements. Our large bullet bins are ideal for most workplaces, especially in kitchens and other areas, where there is frequent waste that needs disposing. They are available with Next Day Delivery.